Poivre Rose de Madagascar (Pink Pepper from Madagascar). This is not exactly your typical Pepper and the rage is on for Pink Pepper. Pink Pepper is now one of the most sought-after spices. Because it is exotic, fragrance houses have started using this rare spice extensively in their eau de toilette (EDT). For the true connoisseur, there are many ways to use Pink Peppers to please your taste buds. Pink Pepper is sweet, aromatic yet mildly spicy. You can top it off on your truffles with Pink Pepper. Dash of sweet, spiciness aroma in your salad. Add in whole. Design a signature dish with Pink Pepper, for the delectable taste...heavenly! 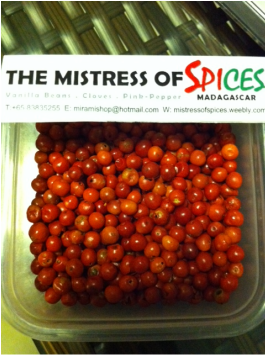 Mind you, the world is jostling for this rare spice, you would probably not find it anywhere else easily. Supply is limited, drop me a note if you are interested to reserve some...to avoid disappointment. Why is Pink Pepper So Hot and such short supply?